This post was written by Chris Sasser, missionary to Bosnia and Herzegovina. 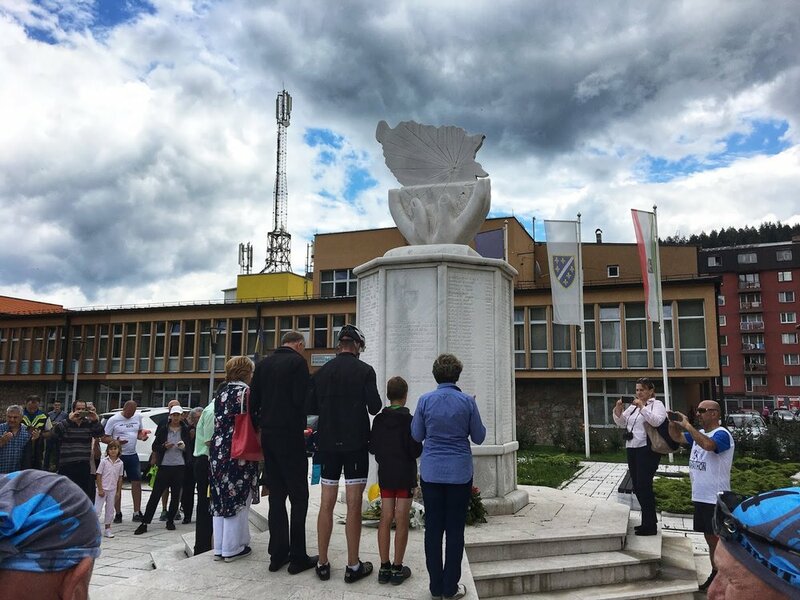 The ride, which was the 14th annual, began in the city of Bihać and concluded in Srebrenica on the eve of the anniversary of the massacre that occurred on July 11, 1995. The ride was to remember the 8372 individuals that lost their lives and to stand with those who survived. Twenty-three years later many families are still waiting for definitive conformation of the deaths of their loved ones. Each year testing is done as new remains are found, and once positively matched, closure comes for some families as their loved one's remains are finally buried. A friend of mine invited me to join him and some riders from the US as they rode along with a few friends we had in common here in Sarajevo. My friend, who we will call Jeremy, as that is his real name, assured me that if I could trek up the mountains around Sarajevo I would be able to handle anything this trip would have to offer. Let's just say if I ever decide to do this again I will train A LOT more. The day before the ride we visited the home of Jeremy's language teacher (and friend) Sumejja. Sumejja's father is an imam in the town of Vinac. He and his wife so graciously welcomed us into their home and treated our group to delicious coffee, juice and desserts. After sharing about the importance of our trip to Srebrenica, Sumejja's father offered to take us on a tour of the local mosque where he serves. It was the first time I had been in a mosque and certainly up a minaret! After saying our goodbyes we loaded up our vans and headed to Bihać, where the ride was to begin. The first day of the ride was full of excitement and ignorance. I had no idea what I had just paid money to do! Bosnia and Herzegovina is a breathtakingly beautiful country with lots of rivers, hills, valleys and mountains. I quickly discovered as beautiful as the mountains are, when riding a bike I much prefer the valleys, or at least the descent to the valleys. After just over nine hours of saddle time and 155 kilometers we concluded Day 1. We started Day 2 in the town of Jajce, at 8:30 am. We were told to be there at 7:00. We were some of the only naive riders there at 7:00. Oh well. At least we weren't late! Day two's ride began in agony for me. Near the end of the first day's ride my knees were killing me and the short night's rest didn't fix the problem for me. I rode the first 33 kilometers and then, after the ride director informed us that the next couple of legs were all up hill, I decided to strap my trek mountain bike on the back of the van and resign myself to being a passenger for the next few legs. I was discouraged that I wasn't going to be able to complete the entire ride, but the director informed all of the riders that Day 3 was far more important than Day 2. I also quickly discovered that many riders had made the same decision as I had, which did make me feel a little less of a wimp. I keep having to remind myself that I am 38 and not 28. My body was not loving what I was doing to it. I did however jump back on my back for the last 25 kilometers of Day 2. Riding on the highway in the rain as the sun was setting was exhilarating! We finished Day 2 in Sarajevo, so I was able to ride straight to the apartment, get a shower, and sleep in my own bed before rushing back out for the final day. I was determined to complete Day 3 no matter what. My knees were killing me and my stomach was anything but agreeable, but I was determined. Day 3 was full of experiences and emotions. As we traversed our way from Sarajevo to Srebrenica we found that our arrival was decidedly different town to town. In some towns the streets were lined with people clapping, cheering, showering riders with flowers, and handing out water and snacks. In other towns, asides for police officers directing traffic through the streets, there was barely anyone outside. The first two rest stops on the final day's ride included memorial ceremonies honoring those lost in their towns. I, along with several people from our group, had no idea what we were about to experience at our stop in the town of Olovo. After the ceremony had concluded a lady came up to one of our riders who was standing next to me. She asked Sumejja if she would translate her story to him. The lady began to share how her school-aged daughter, was taken during the war and was brutally violated and then viciously murdered. Sumejja, with tears running down her face informed us that the lady said that when her daughter's body was found she had around 100 stab wounds. We all stood there crying. What could we say? Exhausted from our ride and now gut-punched by the atrocities that this young girl suffered, and the heartbreak this mother has endured, we were speechless. Eric, the rider who this story was directly being told to, asked if he could give her a hug. Then they embraced. Though this woman's story was heart-wrenching, the moment was beautiful as a middle aged woman, whose background I do not know, told her story to our muslim friend who then translated the story to an evangelical pastor. All of us in that circle cried together, hurt together, loved together. The next day would mark the anniversary of the genocide in Srebrenica. It would also mark our family's one-year anniversary since moving to Bosnia and Herzegovina. We didn't realize this when we moved here. But, our hearts, as followers of Jesus, is to share His love and care for those who need it. I am truly grateful to have been a part of ride. Maybe I did only ride 400 of the 500 kilometers, but I got what I came for. I had come to learn and to try to understand.